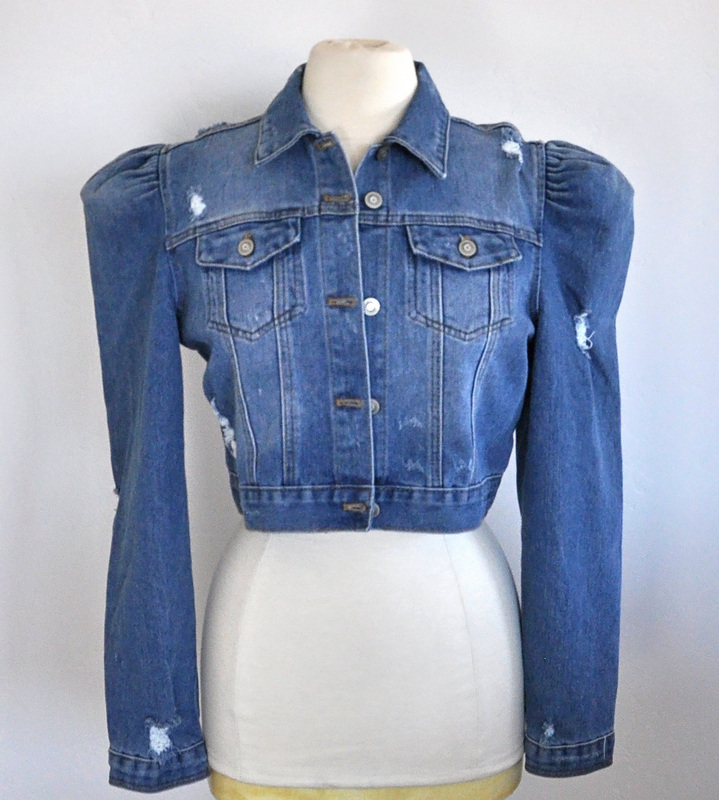 I recently came across this jean jacket at Deseret Industries. I thought it looked super cute…until I tried it on. The sleeves, you guys, the sleeves. They looked 100% outrageous on me because they puffed up too high on the shoulders. While I think princess sleeves can look beautiful on some people, I have broad enough shoulders as it is, and they weren’t doing me any favors. I also saw potential for some fun embellishment, so I jumped right in and purchased it. I went directly from Deseret Industries (the DI as we call it here), and headed for my local JOANN. 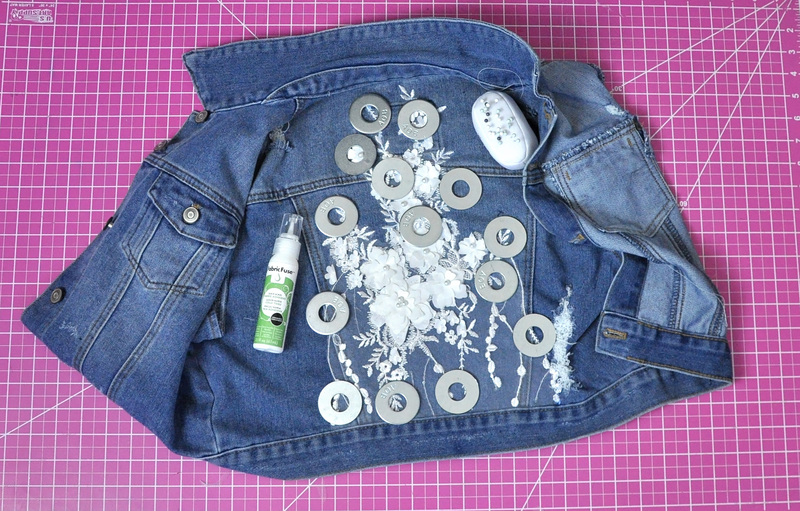 There I picked up some fabric glue that I could use to apply some material as an embellishment. 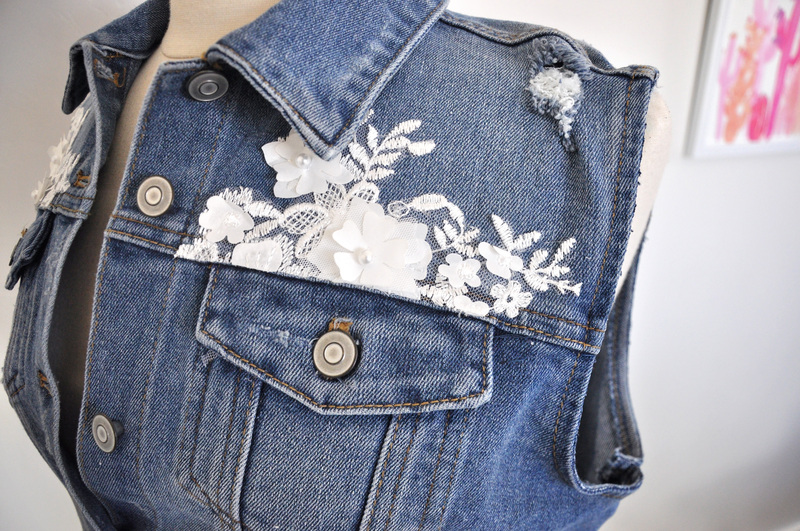 The fabric I used is from JOANN’s new Giana special occasion line. Here are the before images in all their glory. Before I began, I gathered my supplies. 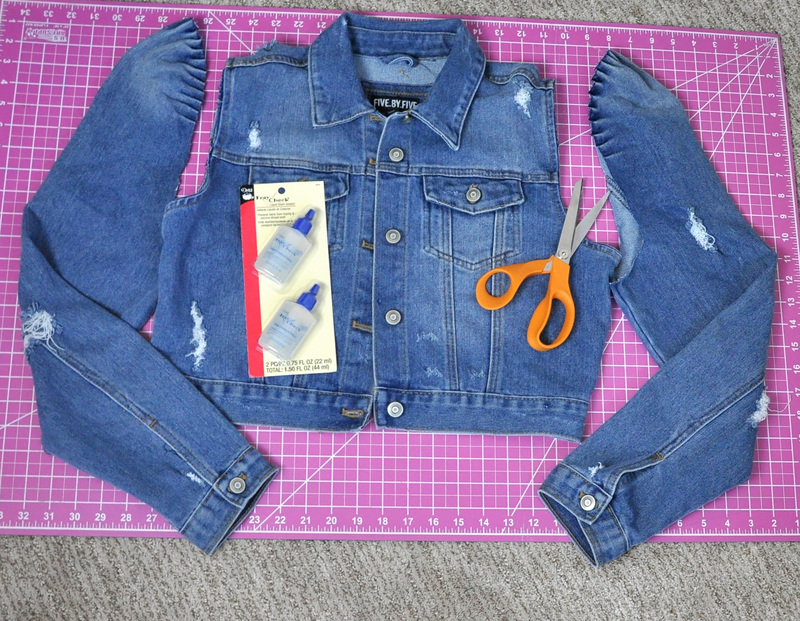 The first step involved carefully cutting the sleeves off right next to the seam. Once removed, I applied Fray Check all around the arm band to ensure that fraying would not become an issue in the future. To add the embellishment, I carefully looked over my Giana fabric, until I found a piece that would be the right sized applique for the back. 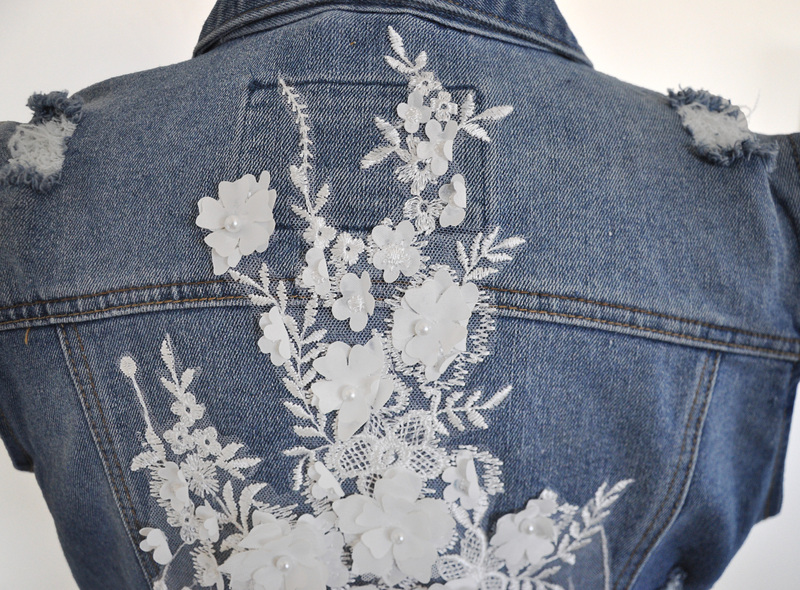 I then tediously cut off the extra netting around the embroidered parts on the top to make it blend more seamlessly with the back of the jean vest. 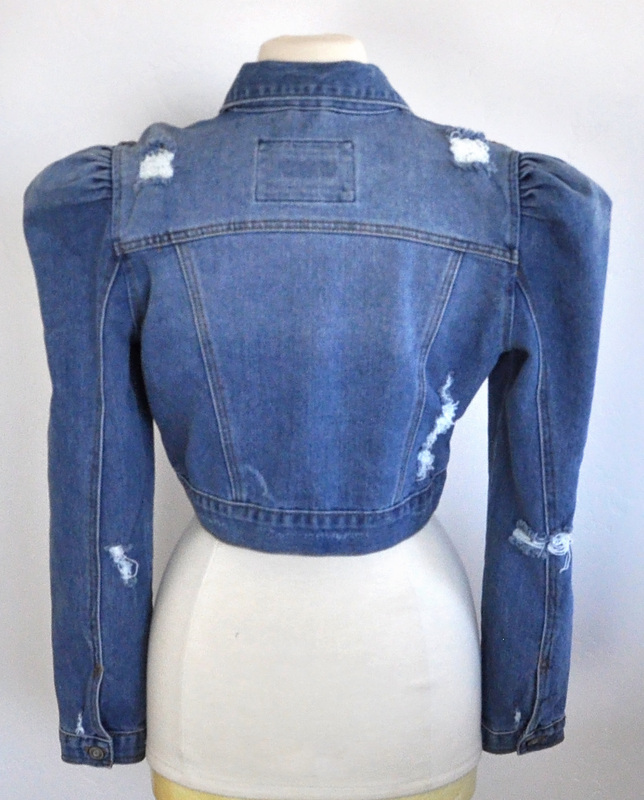 Once I was satisfied with the shape of my applique, I used fabric glue to carefully adhere it to the denim. I used weights (from home depot) for two purposes: 1. 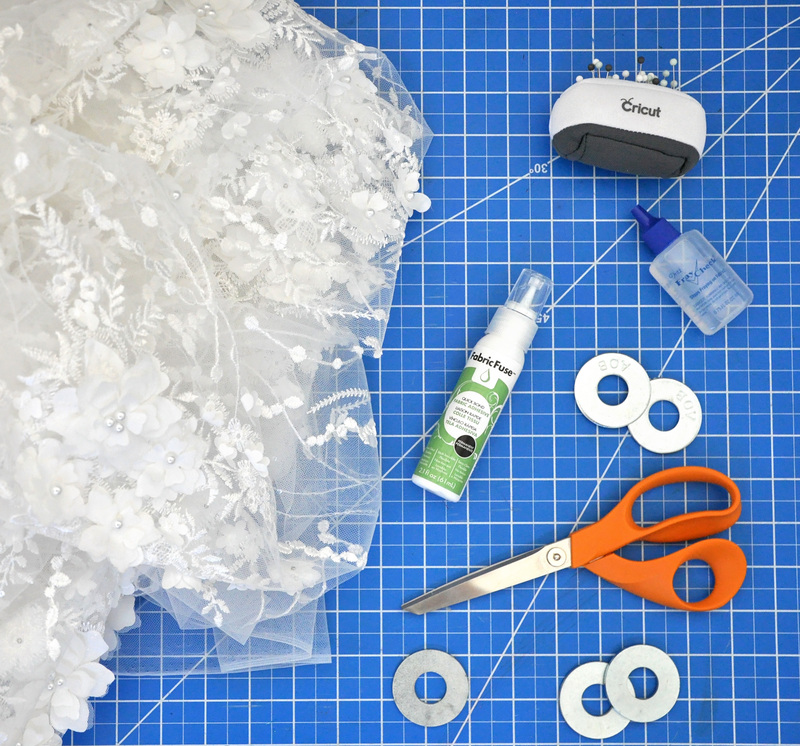 To hold fabric down onto the adhesive. And 2. To help me see where I had already applied the adhesive. 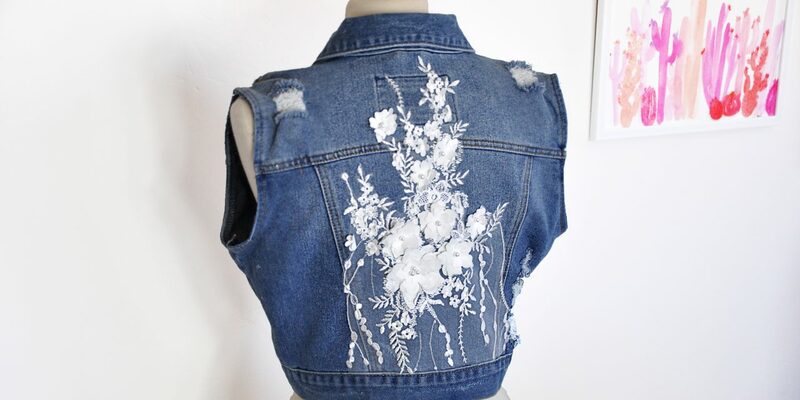 I repeated the same steps for the front of the vest. My goal was to make it look like the flowers were blooming from the front yoke pieces. I think it gives it a very boho chic feel. 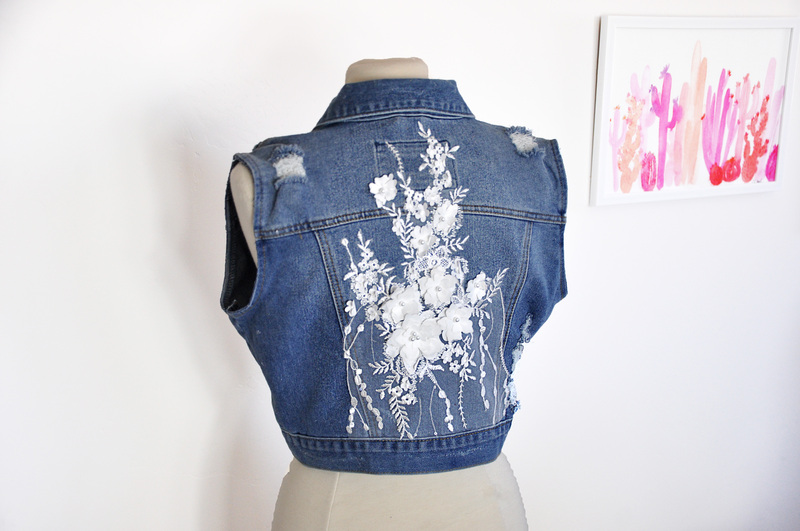 I also used Fray Check on the embellishment fabric when I had to cut through the flowers. I didn’t want them to fray off the vest in the future. 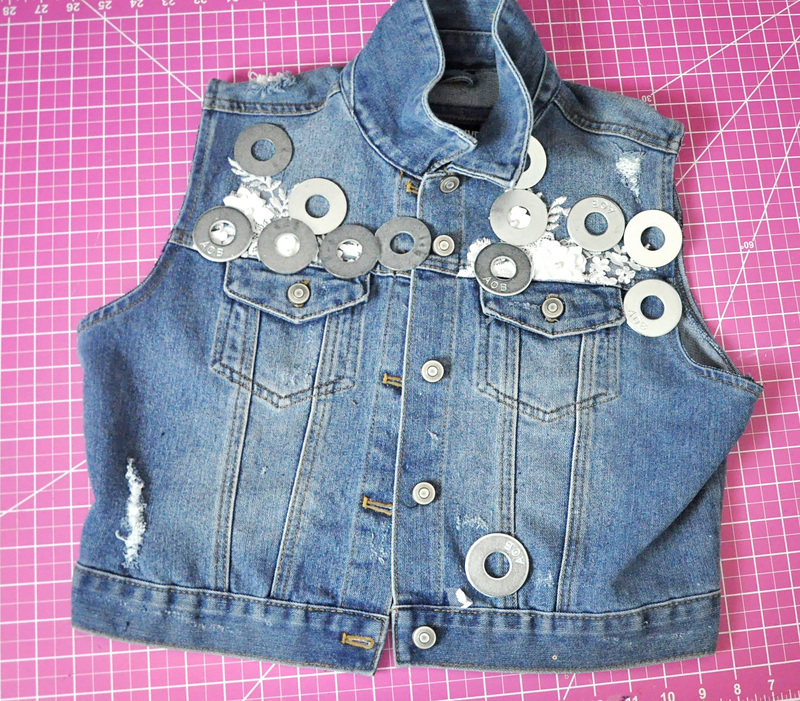 Once everything was dry and set, my vest was finished! 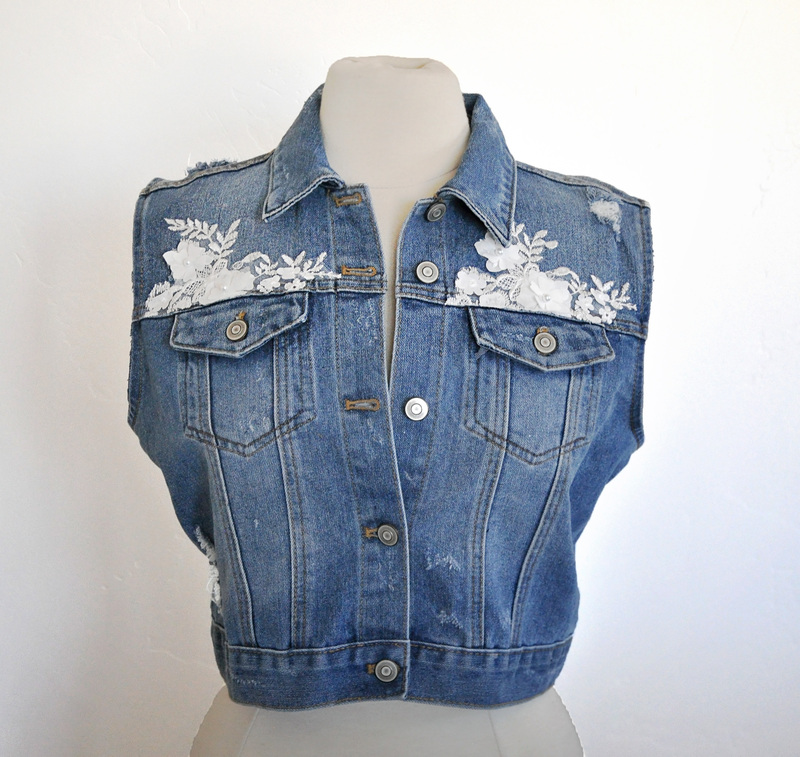 I love that I was able to turn an ill-fitting jean jacket into a custom embellished vest. 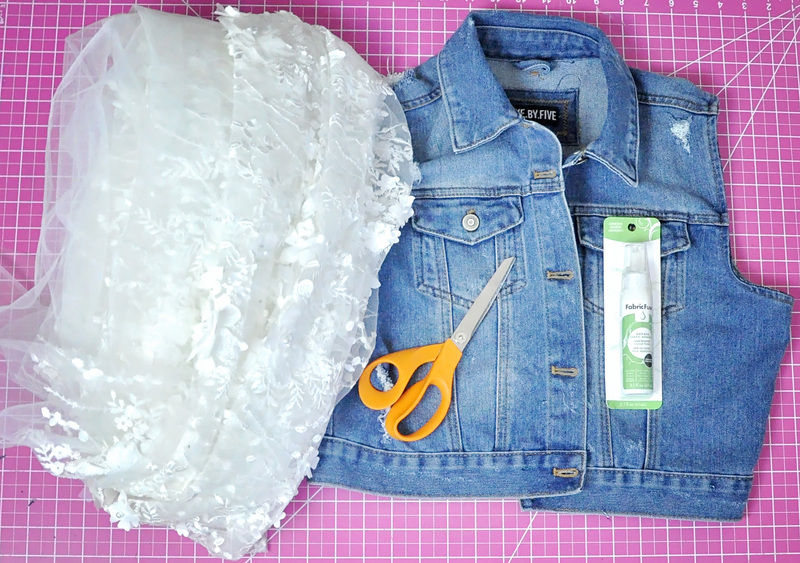 The jacket was $8, and my supplies were minimal since I already have most of them on hand.